Rainford High School is celebrating a fourth win for their PE department at the prestigious ‘Educate Awards’, held at Liverpool’s Anglican Cathedral on Friday 16th November. The PE Department won the ‘Outstanding Commitment to School Sport Award’ for the fourth time in the past six years, following wins in 2013, 2014, 2017 and now 2018. 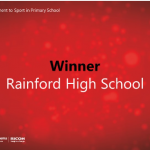 Judges commented on the wide range of opportunities offer at Rainford and the inclusive, yet aspirational and high quality sporting offer that consistently results in outstanding team and individual success at local, regional and national level. Rainford High’s commitment to developing ‘the whole child’ through outstanding sporting provision can be illustrated by the offer of over 200 Inter-School recreational and competitive opportunities. As well as challenging gender stereotypes surround sport by significantly increasing the number of girls playing rugby and football and doubling the number of boys doing dance and cheer leading. The PE department also continues to develop ‘future leaders’ through recognising and developing students’ leadership skills across all Key Stages. Rainford High Sports Leaders have an enviable reputation for excellence in the local community and have supported the development of sporting opportunities for future generations within St Helens, through leading primary transition clubs at Rainford High and delivering a range of sporting activities in feeder primary school schools; during and beyond the school day. This award is testament to the talents of our fantastic students, the commitment, time and dedication of the PE staff and the consistent support of the school, sponsors, partners and parents in providing all students with the opportunity to achieve sporting success. Many congratulations to all!